My name is Corey Thibodaux. 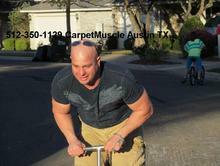 I founded Carpet Muscle carpet services in Austin Texas in the Summer of 2001. I have seen it through several declines in the economy, so I remain to serve my clients even if there are less of them at times. My past career was in the telecommunications industry. The company name was brought about by my lifelong gym memberships, and past competitive bodybuilding. Committed to helping my customers in any economy.